American musicians will perform in Baku on July 17-18. 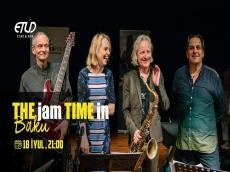 Guests of ETUD Cafe & Bar have a chance to hear jazz compositions performed by Monica Herzig (pianoforte), Peter Kinley (guitar), Robert Sabina (bass), Josh Roberts (drums) and special guest Edward Orgill (saxophone) on July 17-18, Novosti.az reported. Music lovers will enjoy the best of jazz music. Monica Herzig and Peter Kinley are outstanding composers, arrangers and musicians on the American jazz scene since 1988. They worked together with guitarist, pianist and singer Leni Shtern, famous American jazz bassist Rufas Reid, as well as a British musician, singer and songwriter, multi-instrumentalist Sting. Monika Herzig recorded with the jazz fusion group BeebleBrox and has produced four albums as leader of the Monika Herzig Acoustic Project. Peace on Earth was released locally in Indianapolis in 2008 and was released nationally in 2009 on the Owl Studios label.